Good practice for photography workflow, whether you are a beginner or a pro. Adobe, the developer of such popular programs as Photoshop and After Effects, has a photo program that has taken the world by storm in the last decade. It operates as both a light version of Photoshop and a catalog, allowing you to quickly take photos from your camera, make edits and share your images with the world! With Lightroom, you have all the tools you need to bring out the very best in your images. In this walkthrough, I’m going to show you the best practice workflow for taking photos from your camera’s memory card, importing them to your computer using Adobe’s Lightroom software and some quick adjustments you can make upon completion. This will allow you to easily sort and archive your images for editing, sharing and long-term storage. 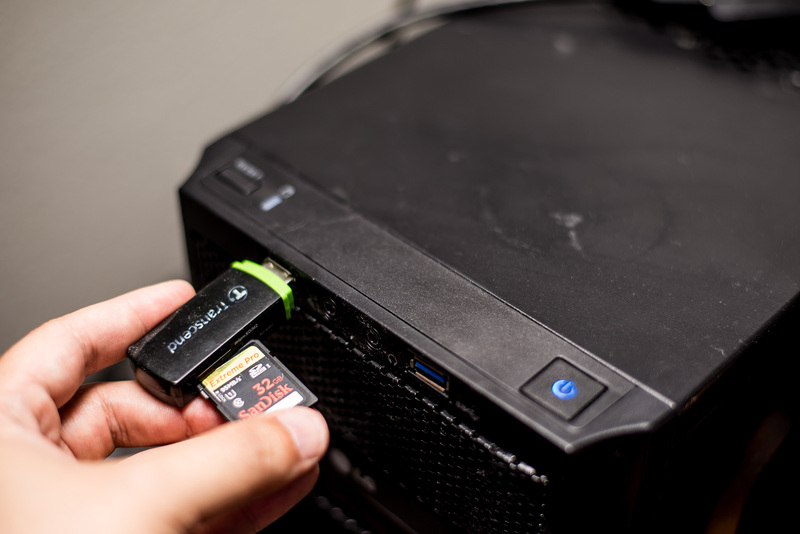 Insert your camera’s memory card into the memory card reader. A standard memory card reader. Yours will likely appear different. Once the memory card has been properly inserted into the reader, depending on your settings your computer may ask you what you would like to do. If this happens, it will likely look like the image below. 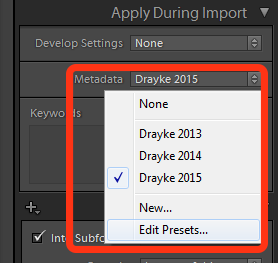 Ordinarily you would see “Import to Lightroom” below the Bridge option here. Choose “Import photos with Lightroom”. 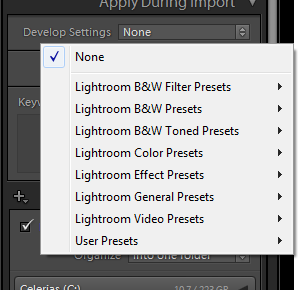 This will launch Lightroom’s import dialog, which will look something like the below. The images in the center should be the ones you are trying to import. Note: If you do this often, feel free to set this as the default option when a memory card is detected. It will usually be named after your camera, in this case it is a Nikon D610. If the memory card was properly detected, it will show up on the left side of the Lightroom import dialog using either the brand name of the card, the name of the camera or a custom name if you have previously formatted it and renamed it. You want to select this as your Source because this is where the images we are importing are coming from. 3. Choose an import folder. You will likely not have quite so many drives to choose from. In Lightroom’s import dialog, you have several options but one of your most important is deciding which location to import your images into. You will find this in the “Destination” box in the lower right. Each photographer’s filing system is likely to be slightly different. What I recommend is creating a new folder on your hard drive each time that you import new photos from different events/days. To create a new folder, simply ensure that “Into Subfolder is checked and then enter your title into the box next to it. This will create a new folder automatically as the images are imported. Name this folder using the date and a short description of what the photos contain, for example “20150708 – Tutorial Images”. 4. Next, choose your metadata template. Metadata is, simply, additional information added to the image that is machine readable only. Metadata does not affect the quality or appearance of your images in any way. So why is this important? By using a template to apply information to your image, you can add your own personal copyright and legal data in a way that helps protect your photos from theft or misuse and makes it easier for any parties who may be interested in licensing the image for use or publication! Below you can see an example of my current metadata template. It contains my copyright information, it states that All Rights Reserved (meaning that no one can use the image in any way without my permission), and provides my contact information for anyone who may wish to obtain permission, or license, to use the photo. For my money, the above are the most important fields to fill out. You can choose to be as sparing or verbose as you like. These are primarily for your own organization purposes. 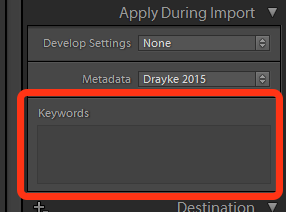 The entire world runs on keywords nowadays and Lightroom is no different. Below your choice of metadata template, you see an empty box awaiting your keywords. This is where you would specify what is contained within the images. This makes it easier for you when uploading your images to social photo websites such as Flickr or DeviantArt where the keywords you specified in Lightroom will automatically appear, making your photos show up in searches for those terms! Additionally, if you needed to find all of the photos you’ve taken of a specific subject, you can search Lightroom using specific keywords to bring up all the photos you’ve ever taken of those subjects. Some examples of keywords that I find helpful are: weddings, portraits, senior photos, locations, family, event name, or the subject’s name. The drive that you send your Second Copy to should never be your C:\ drive. This step is optional but HIGHLY recommended. 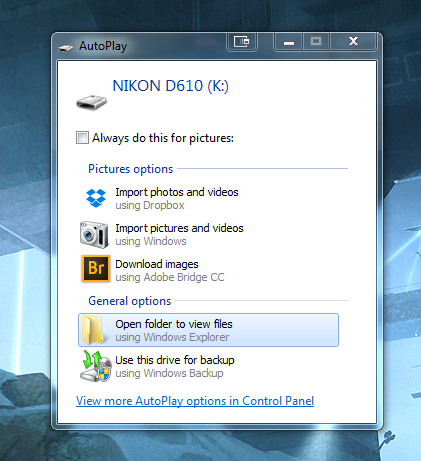 If you have an external hard drive, you should make a second copy of your images when importing them. Do not make a second copy on the same physical hard drive. Hard drives fail all of the time, even brand new ones, and if your images only exist on the drive that failed, you’ve now potentially lost all of those images. Sad day. 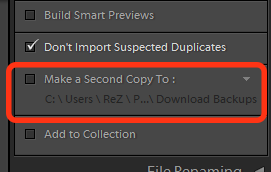 To back up your images, make sure that the option “Make a Second Copy to:” is checked, and then select a folder on your external drive that you would like to back up to. Additionally, if you can also back up your photos to a cloud storage solution, do that as well! The old adage goes: If it doesn’t exist in at least three places, it doesn’t exist at all. This is the default menu you would see upon clicking on Develop Settings. You can add your own categories later. 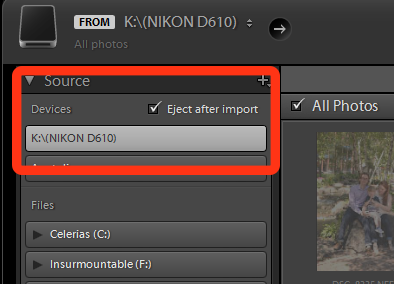 Develop settings refer to changes you can make to your images as you import them. 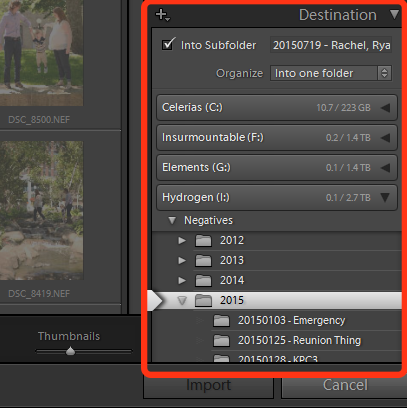 This can greatly simplify your workflow and create edits to your images instantly! For example, if you wished all of your photos looked old-timey, you can go into your Develop list, hover over “Lightroom Color Presets” and select “Aged Photo”. This will apply the old-timey filter to all of your images as they are importing. Thanks to the way that Lightroom handles image edits, you can at any time revert our images back to their original state, or choose a different filter, if you later decide that the old-timey effect isn’t to your liking. Below, you can see some examples of a few Lightroom presets that you can fool around with. Now that you’ve imported your images from the memory card, and copied them to a second location, you can remove the card from the reader, put it back in the camera and format it. This way you’re ready to start shooting more images with a completely fresh card! This covers the basics of importing images into Adobe’s Lightroom program. For more information on editing images in the Develop mode or using the other modules, visit Adobe’s help pages specifically for Lightroom here: https://helpx.adobe.com/lightroom/topics.html. As always, when it comes to photography, the most important step is to be taking photos, so get out there and start capturing some beauty!